William Burman and Annie's children were named in the previous chapter, and it was said then that Arthur only lived a few months. The eldest child, Laura, was born on 3rd July 1888; William Stanley on 23rd July 1889; Arthur on 23rd February 1892; Bella on 3rd July 1893; and Marjorie Edwina on 3rd August l906. With the exception of Laura, the baptisms are all recorded in the Clovelly Parish Registers. Beside the entry for William Stanley it notes 'baptised by the Rector of St. Mary's, Charterhouse', although no reason is given. Laura was, in fact, the first of this generation to marry, in 1912. Her husband was Henry William Boyde, an Engineer in the Royal Navy. At the time they met, Laura was working in Torquay as a dressmaker. One day the 'Fleet came in', carrying Henry Boyde with it. Henry retired from the Navy in 1932, but was recalled for service during the Second World War. The couple lived for a time in Plymouth, and then moved to Northam, finally settling in Plymouth, where Henry died in 1963. Laura herself died on 22nd April 1979, and both are remembered on a headstone at Clovelly. Places mentioned include Devonport, Falmouth, Lossiemouth and Portland. By now, William Stanley had met his future wife, May Ellen Beer. Mary was the daughter of John Beer of Hartland and his second wife, Annie Littlejohns from Parkham, and was born on 13th January 1889. The Beers were a long-established Hartland family, and have been traced back to 1698. The Littlejohns were not quite so local to Clovelly, having originally been a Shebbear family in the 1750s. Mary Ellen came from a large family, having no less than eleven brothers and a sister. Their mother had died in 1902, aged only 35, and Mary Ellen had been left to take her place. One of her brothers, Ernest, was to live with her for the rest of her life. In October 1913, the postcards give the first reference to William Stanley's service on board HMS LION, which he had joined on 4th June 1912, and was to remain his ship for the rest of his career, unusual in time of War. She was one of the Royal Navy's most modern vessels, having been built in 1910 as a new type of ship, a Battle-cruiser. She weighed 26,350 tons, and was armed with eight 13.5 inch guns, sixteen 4 inch and four 3 pounders. Battle-cruisers were first developed by Admiral Sir John Fisher as advance scouts of the battle fleet. They were armed in the same way as Battleships, but with thinner armour, and consequently higher speeds. The correspondence gives a good picture of William Stanley's service on this ship. In October 1913 they were in Invergordon, but by December had moved south to Devonport. Early in 1914, Northern Spain was visited. In February the ship was at Finistere. At the end of the month it was at Vigo, and then on 4th March at Pontevedra: 'Arrived here from Vigo yesterday and leaving again on Friday for Arosa Bay'. Arosa Bay was reached on 5th March: 'Arrived here Friday from Pontevedra'. By June they had returned to Portland. Soon after this the LION visited Russia: 'June 11th, HMS Lion Portland Thursday. Dear Nell, Received your letter alright today. We are leaving here at one o'clock tomorrow for Reval (Russia) lovely weather. Kind regards. Stanley'. The trip to Russia took six days: 'June 18th Reval Russia. arrived yesterday. . Leaving again on Sunday for Kronstadt.' (Reval is now Tallin, in Estonia.) On 23rd June they were in St Petersburg, and on 28th June, Kronstadt: 'Just a line to let you know we are still having very good times here and lovely weather. The Czar came aboard our ship yesterday.' Kronstadt was to play a significant role in history three years later, as a naval mutiny there precipitated the Russian revolution. The ship returned to Portland the following month, and in August 1914 the First World War broke out. 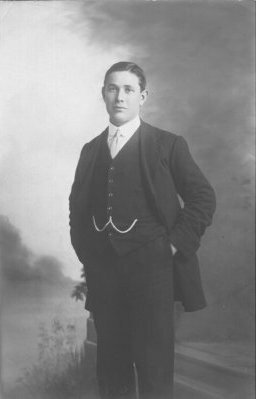 William Stanley was demobilized from the Navy on 7th September 1919 and returned to Clovelly to live, starting his service with the Lifeboat soon afterwards. However, he continued to be a member of the Royal Fleet Reserve, Devonport, until finally demobilized on 5th June 1921. Service with the RFR meant a man continued in his civilian job, but returned to a ship at intervals for periods of training. On Tuesday 28th September 1920, Belle married a local man, James Whitefield, at Clovelly, and the event was described by the Hartland and West Country Chronicle. Amongst other details it records that the bride was attended by her sister Marjorie, then aged 14, and the best man was Stanley Prince. Immediately after their marriage Belle and James lived in Ross-on-Wye, but later returned to Clovelly where they took charge of the Red Lion, which thus came under the care of the Princes, even if indirectly, for the third time. Belle and James' family eventually consisted of a son, William, and a daughter, also Belle. Belle died on 11th February 1984, and James the following year on 15th December. Both are buried at Clovelly. The same article describes the wedding on the following day of 'Miss Ellen Mary Beer' and 'Mr. Stanley Prince'. The bride's brother, Fred Beer, acted as best man. The reception was held at Dyke Green and the couple spent their honeymoon at 39, Parley Terrace, Stoke, Devonport. They returned to 135 Dyke Green, which was to be their home until the end of 1922. At about the same time as his wedding, William Stanley and his father were pall bearers at the funeral of Mrs. Mary Jane Jones, a 'highly respected' resident of the parish. In 1936, Marjorie married John Dunn, a motor mechanic. The couple moved to Bideford to live, where John worked for Elliots Motors. They had a son, also called John. Marjorie died on 12th March 1973. After his wedding, William Stanley set about his new occupation as a fisherman. He eventually settled at 2, Mount Pleasant, where he lived until his death. Amongst other activities, he was a Member of the Clovelly British Legion, Secretary of the Clovelly Football Club, and for 23 years Secretary of the Independant Order of Rechabites. In 1945 arthritis forced William Stanley to retire from fishing, although he continued to serve with the Lifeboat for another 5 or 6 years. 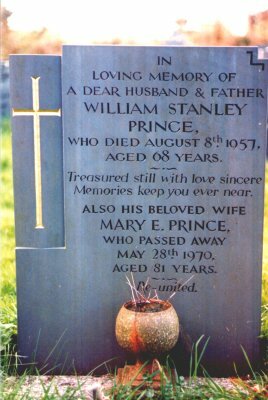 He died on 8th August 1957, aged 65, at Clovelly Filling Station, the home of his son. Obituaries in local papers show that a large number of villagers attended the funeral, and many of his friends and colleagues helped to carry his coffin from Clovelly Cross to the church. His widow continued to live at Mount Pleasant until her death on 28th May 1970. She was 81.